Bonnyrigg Rose assistant boss David Burrell hailed his players for rising to the occasion as they secured another Lowland League scalp to ease through to the semi-finals of the South Region Challenge Cup. These are the kind of matches which have been sadly missing from New Dundas Park this season – big game cup ties which get the heart pumping and see supporters come out in their droves. The Scottish Junior Cup is now in the past for Bonnyrigg, but this tie had that same feel to it for the home club. “It was a game the boys have been looking forward to all week,” said Burrell. “We want to play against teams that are in a higher league; that’s where we want to get to. It was an opportunity for us to go out and set a marker and also get to a semi-final. 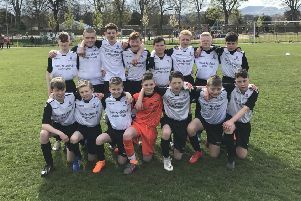 Rose had knocked out Lowland outfit BSC Glasgow in the previous round, so East Stirlingshire certainly held no fear for the East of Scotland Conference B league leaders. The home side – in their all-white reverse kit – were well on top in the first half, with visiting goalkeeper Jamie Barclay keeping his side in the tie with a string of saves to stop Rose running away with the match. Burrell continued: “All that was missing in the first half was us putting the ball in the back of the net. We had two or three really good chances in the first half, but I thought in the second half we came out and in difficult conditions we managed the game really well. It was a professional performance and it could have been more. Striker Aaron Murrell, in great scoring form since his recent move to Bonnyrigg, had the home side’s best chance in the first half when put through one-on-one with Barclay by captain Johnny Stewart, but his lobbed attempt was dealt with by the keeper. Rose had a penalty appeal waved away by referee Stewart Luke five minutes into the second half when striker Keiran McGachie went down when he was about to shoot. Luke did point to the spot ten minutes later, with what looked the weaker of the two appeals, after Dean Brett went down. Midfielder Lee Currie dispatched the penalty, and he was celebrating once more five minutes later when his corner-kick was headed into his own net by Andy Rodgers to the delight of the home support, with Rodgers the Rose fans’ pantomime villain. Home substitute Ross Gray was crucial in pressing home Rose’s advantage when he came on and looked to have made it three only to be denied by the underside of the bar. Rodgers saw red late on after he was booked for a second time for his protests after being taken out himself, before he went down clutching his face amid a rammy in the home box on his way off the pitch, with home defender Kerr Young given a straight red card. The draw for the semi-finals is yet to be made with East Kilbride, Hill of Beath or University of Stirling awaiting Robbie Horn’s men. Bonnyrigg Rose: B Young, Brett, Brown, K Young, Moyes, Horne, Turner, Stewart, McGachie, Currie, Murrell (Gray). East Stirlingshire: Barclay, Greene, Ashe, Grant, McKee (Gallagher), Smith (Brisbane), Rodgers, MacGregor, Allum, McCafferty (McCaughie), Gray.